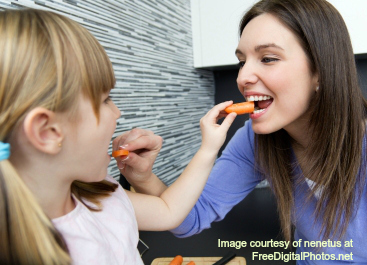 Involving children in meal choices and preparation can help to improve their eating habits and establish a healthy relationship with food. They’re also learning important life skills vital for future independence. 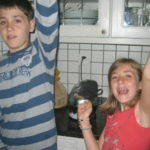 Food preferences and eating habits often develop early in life. Helping to prepare their own meals can encourage an interest in healthier foods or persuade picky eaters to try or experiment with new or previously refused foods. It can also provide a wonderful hands-on, multi-sensory experience. 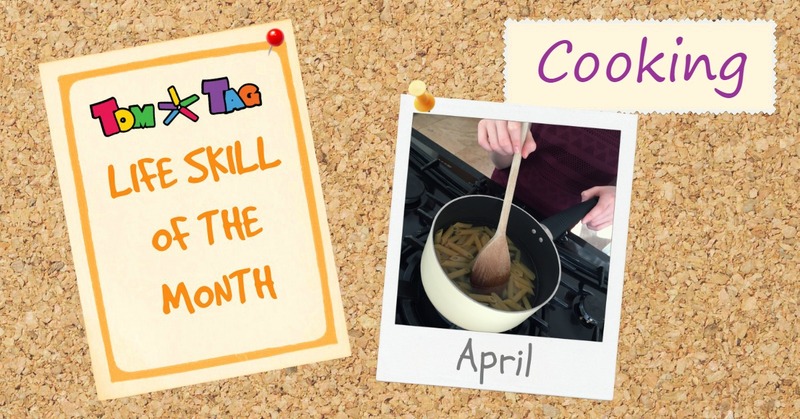 Learning to make a hot drink or sandwich would also be a great starting point when developing independent life skills with older children or young adults with autism. Our newest sticker pack – Food and Drink Basics – includes symbols related to preparing and serving hot drinks, breakfast, snacks and simple lunches. 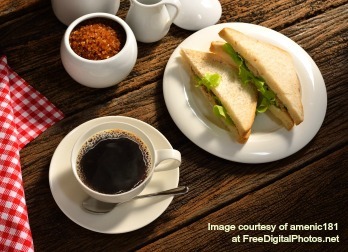 Create step-by-step instructions for making breakfast, snacks, simple lunches and hot drinks. List the food choices available to your child for breakfast, lunch and snacks. List each family member’s food preference as a reminder to those preparing the food. Whichever way you choose, here’s a few simple tips to follow. Choose tasks that are appropriate to your child’s developmental level. 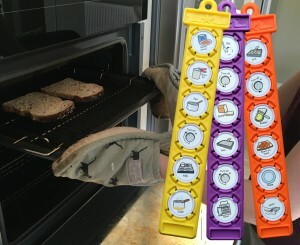 Starter tasks might include washing fruit, cutting soft vegetables with plastic knives or spreading butter on toast. Move on later to more complex tasks requiring greater motor skills, concentration and focus such as using a peeler, chopping with sharper knives or boiling a kettle. 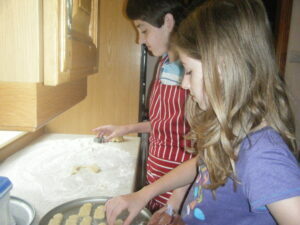 Having children help in the kitchen provides a natural opportunity for education on a number of topics. 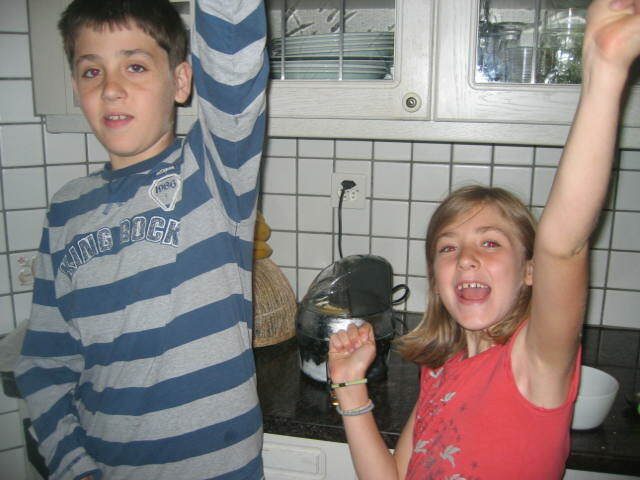 Teaching children to wash their hands and kitchen surfaces before preparing food or showing them safe ways to use knives helps them to understand the importance of kitchen safety and hygiene. Practice reading and maths skills by comparing packet labels and counting or measuring out ingredients. 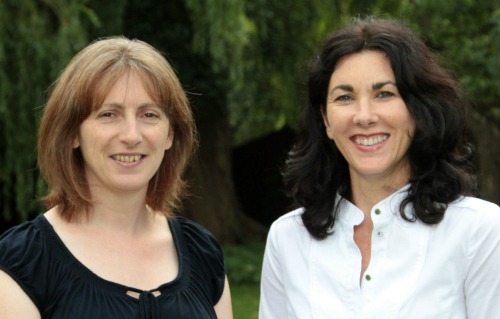 Talk about the effects our choice of food has on our health and lifestyle. Try out the NHS Change4Life Sugar Swaps app for a fun way to find out how much sugar is in our food and drinks. If children associate food with enjoyable experiences, they’re more likely to be receptive to trying new foods and eating healthily. 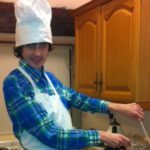 Fun meal preparation activities can be particularly helpful if you have a child with sensory issues around food. Cookie cutters are brilliant for turning boring sandwiches into enticing nibbles. A selection of different coloured fruits or vegetables look great laid out to make a rainbow. Our old favourite Pinterest is a fantastic source of fun food ideas for kids. If you’ve got anything left over from halloween you could always take some inspiration from this pumpkin horse! Having kids help out often means a bit more mess to clear up afterwards. Try to be patient and allow for a little extra mess whilst they’re still learning. 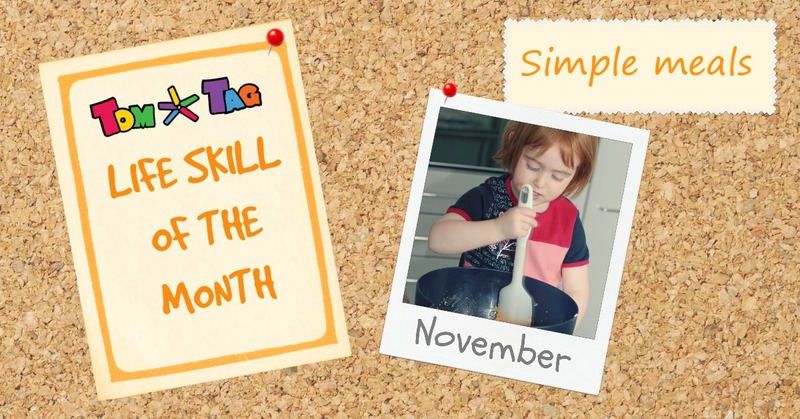 Check back to October’s Life Skill tips and you might even get them to help out with the clearing up too! Get free visual recipe sheets for tasty treats and snacks from The Autism helper. Try The Eating Game from Canada if you’re looking for a more comprehensive visual food planning tool. 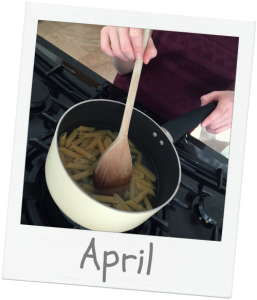 Cheeriosmilkandspoon is Sarah’s personal blog account of parenting a child with food aversions and eating challenges. When was the last time you enjoyed a family baking session? 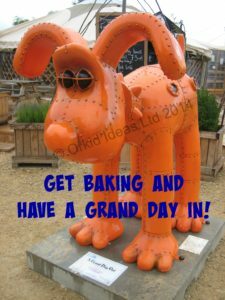 1st-7th December 2014 is Wallace & Gromit’s Big Bake week so it seemed like a good excuse to talk about the benefits of baking with children. As well as a chance to spend some quality time together and enjoy a sense of shared achievement, baking with children can help to build their self confidence and has numerous additional benefits. Counting and measuring ingredients puts maths skills to use in a meaningful and practical way. Get a real hands-on science experience by making observations and predicting change. Practice reading skills, learn new vocabulary and don’t forget to follow the steps of the recipe in the correct order! Talk about what utensils and ingredients you need to prepare before you begin. Discuss what might happen if you missed out an ingredient or step of the recipe. Involve the child in making choices about decoration or variations. Children use their senses to learn more about the world around them. Sight – does it looked baked yet? Taste – enjoy the fruits of your labour and appreciate that wonderful home-baked flavour! Rubbing a mixture into breadcrumbs or using cookie cutters can develop the strength children need in their fingers to help with writing skills and self care issues. 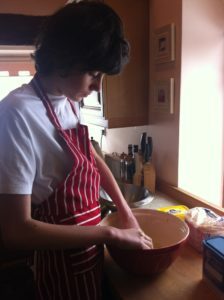 I often use baking to engage with my autistic son. 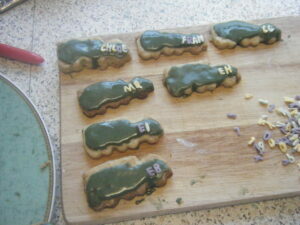 His current interest is Eddie Stobart lorries so a lorry cookie cutter and green food colouring were all we needed to turn our favourite cookie dough into the iconic lorries! On other occasions I’ve used his obsession with numbers to encourage him to get involved in making number-shaped biscuits. There are so many free recipes and resources on the web these days – check out Jamie Oliver and Baking Mad for some of our favourites. Remember to praise them for their culinary achievements and don’t forget to encourage them to help you wash up afterwards!